Castle Cycle & Motor Works - Castle bicycle manufacturer. Homepage. This page: A.J. Jones of the Castle Cycle & Motor Works in Barnstaple, for bicycles and motorcycles. Agent for British bicycles and motorcycles in the 1930s. A.J. 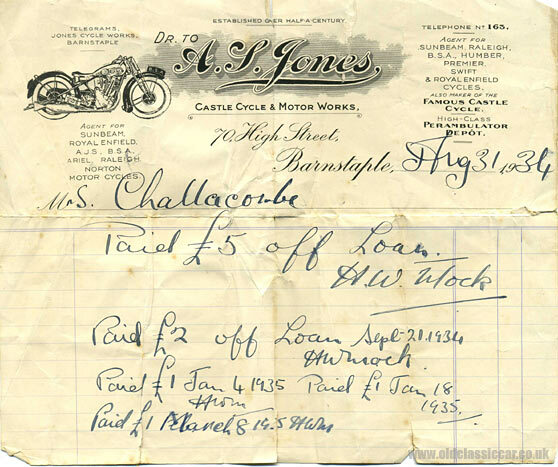 Jones, of the Castle Cycle & Motor Works, acted as a sales agent for both bicycles, and motorcycles, of British manufacture in the pre-war era. This particular headed letter - a receipt for payments made on a loan - dates to 1934, and the text at the very top tells us that they'd already been in business for over fifty years by that time. Listed to the left are the makes of motorcycle that they were agents for :- Sunbeam, Royal Enfield, AJS, BSA, Ariel, Raleigh and Norton. To the right, the makes of bicycle that they could supply :- Sunbeam, Raleigh, BSA, Humber, Premier, Swift and Royal Enfield. It also mentions that they produced their own bicycle - the Castle - appropriate, given the name of the Works they operated at. If supplying fine British cycles and motorcycles wasn't enough, A.J. Jones also did a line in high-class perambulators no less. The motorcycle shown at the top left of the receipt is a BSA, perhaps someone can identify the model? The cycle works' address was 70 High Street, Barnstaple, in Devon. The premises, or at least a building in this same position, still exists, now part of a Boots Chemist, but obviously 70+ years ago it was a much more interesting establishment, packed as it was with interesting pre-war motorcycles and bicycles. More items of motoring paperwork relating to pre-war vehicles and garages can be found in the Motoring Collectibles section of oldclassiccar.co.uk.